The M-Inform system is scheduled for a software upgrade on March 5, 2018. This document provides a description of changes included in the upgrade. Path >> – New! Click to display breadcrumbs. My Home – New location. Click to return to your home workspace. Any announcements will display here in a new format. Updated look for some buttons. Click More… to view additional tabs. When uploading supporting/related documentation, new drag and drop functionality allows you to easily attach documents. When using drag and drop, the document name will default with the file name. To rename the document, click Upload Revision and enter a new Title. 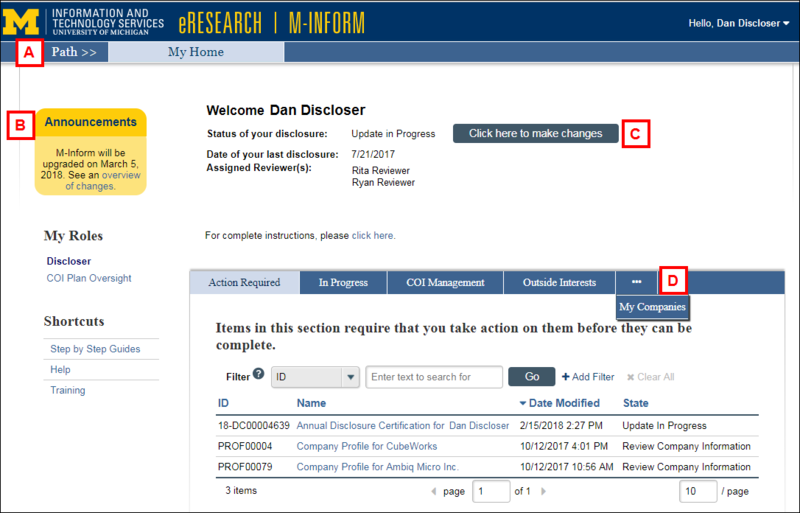 To View revision history or Delete a document, hover over the document name line and the buttons will appear. When uploading a revision to an existing document, you can use the drag and drop feature if the title of the document is that same as the original. The revised document will display with an updated version number. When dragging and dropping a document with a matching title, the following selection box will appear. Select Revision to stack the new version on top of the previous document.